Let me preface this post with a disclaimer, we are not lawyers, we are webmasters and marketers. What we know about this has come about by being active in the industry, working with associations such as PAII and AIHP. and having clients that have needed assistance with this on their websites. The confusing world of web design gets even more complexed when you are trying to be compliant with new laws, search engine updates and other criteria. On June 5th 2018 the final version of WCAG 2.1 was released and while many people are only hearing about the new rules when they get a letter from a lawyer all small business owners that have a website and a location where customers visit them are wise to get their webmasters to study the document and make updates. When it comes to your hotel website the new laws require that anyone who is blind, deaf, prone to seizures and any disability should be able to view and use your website and have the same outcome as an able bodied person. Adding to the confusion is if you need to have an ADA room at your property and similar to the website rules this can also be a little open to interpretation. Some properties have already gone through changes to accommodate handicapped guests with the addition of handicapped showers, ramps to rooms, brail signs, levers instead of knobs for door handles, and wheelchair accessible rooms. Other properties, because of a number of reasons maybe exempt. It is up to each owner/general manager to understand if their property is required to have an ADA accessible rooms. Depending on the size of your property, if your property was built after Jan 26th, 1993 and other criteria will depend on the number of rooms you should have available. 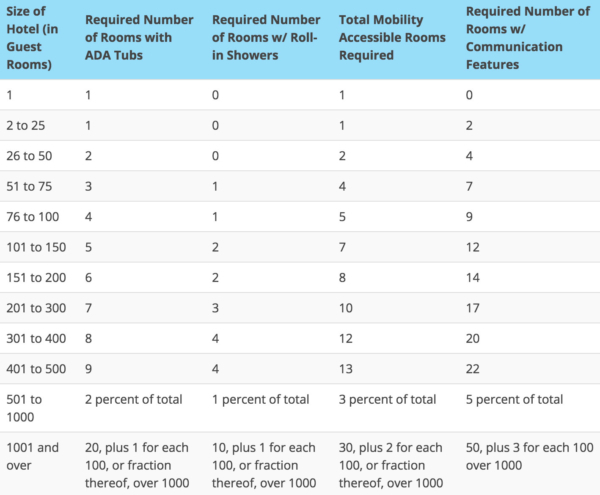 The chart below is a good reference guide on what you should have at your property if you are required to have an ADA room. This chart came from WheelchairTravel.org and they have some good information for property owners that might want to read more. The chart was created using section 224 (specifically 224.2 and 224.4) of the 2010 ADA Standards. The original document for accessibility in regards to websites came out on December 11, 2008. The standards and guidelines for version 2.0 have become out of date. A lot has changed since 2008, including the use of smart phones and other mobile devices, which have now surpassed desktop visitors. A new version was released in June, 2018 and is known as WCAG 2.1. This version added 17 new criteria that addresses a number of accessibility issues in regards to barriers on mobile devices. It still uses the A, AA and AAA conformance; and it now addresses mobile technology, low vision and people with connective disabilities. A, AA, AAA, are levels of compliance and most private businesses are attempting to meet AA requirements. – note that the guidelines can be interpreted differently but here are the most recent updates. Orientation – landscape or Portrait? – content must not restrict view and operation to a single display orientation. Some users have fixed orientation views such as attached to a wheelchair. Therefore content must be available in both landscape and portrait mode. Identify Input Purposes – add information that identifies what the input field is for, for example email sign up, booking form fields. Helps people with cognitive disabilities understand and use form inputs. Reflow – avoid horizontal scrolling. A large number of people with low vision need to increase their screen size often more than 200%. Scrolling increases the effort to read by 40 to 100 times. Keep vertical scrolling content at a width equivalent to 320 CSS pixels, horizontal scrolling content at a height equivalent to 256 pixels. Non-Text Contrast – visual presentations should have a contrast ratio of at least 3:1, meaning that the contrast for text or graphics need to have enough contract for a low vision person to see them on the screen. Text Spacing – text needs to have adequate space between lines and letters. Low vision users need to be able to override paragraph spacing, letter spacing, word spacing and line height. Content on Hover or Focus – content that only appears on mouse overs or on focus can present challenges for users with low vision where their mouse accuracy might not be great. Character Key Shortcuts – Applies to mobile. Helps users who rely on speech-to-text technologies to interact with content without inadvertently triggering some functionality based on a a shortcut. Like a keyboard shortcut. Pointer Gestures – requires that all functionality that uses multipoint or path-based gestures for operation can be used with a single pointer. Applies to mobile, to help users who cannot accurately perform complex pointer gestures such as touchscreen swipes, or two finger pinch/zoom. Pointer Cancellation – functionality that can be operated using a single pointer to help people inadvertently initiate touch or mouse events with unwanted results. Helps reduce the chance that a control will be activated accidentally. Label in Name –mobile, helps users who rely on speech to text technologies to interact with content and submit things like forms. Motion Actuation – mobile, having to tilt or shake for an action to take place. The device maybe mounted and not possible to move. Status Messages – making sure that error or success messages can be easily seen. Users who are blind or have low vision may not be able to see success messages. Identify Purpose – add the context, to meaning of symbols, regions, buttons, links and fields so that the user agent knows what to do with them. Animations from Interactions – motion animation should be able to be disabled unless the animation is essential to the functionality. Some people find animation on a page will give them nausea, headaches and dizziness so it need to be able to be disabled. Warning of timeouts – users are warned of the duration of any user inactivity that could cause data loss, unless the data is preserved for more than 20 hours when the user does not take any actions. Target Size – ensure that the target for pointer inputs is at least 44 by 44 pixels in most cases. Concurrent Input Mechanisms – make sure people can switch from different modes of input when interacting with the web content. Do I have to Comply with Any of This, I live Onsite and only have 4 rooms? The DOJ (Department of Justice) does not require a private business to be compliant. However at the State level you may find that there are different restrictions. This doesn’t stop you from being sued as when it comes to your website anyone searching from anywhere can come and stay and the website has to have certain requirements to be compliant. There are a variety of cases and top hit states include FL, NY and CA. Properties in other states have been hit by residents of these states so you don’t have to necessarily be in a state that has been hit badly, you can be anywhere in the US. You can find open cases in https://dockets.justia.com this site gives you a list of people who have ADA lawsuits in any state. Many of the cases are being made by the same group of people that know lodging properties are low hanging fruit at this time. Limit your liability because you cannot be 100% compliant as the target is constantly moving and changing. Private businesses are being sued even though the DOJ said they don’t have to be compliant. When you have a case against you you have to hire a lawyer to help you fight for your rights and it can get quite expensive. The goal is to try avoiding being sued so you are not a target. You need to work with your webmaster to make sure they are taking care of this as you are the one who is responsible, not the webmaster. Listed below are some of the basics that need to be covered. Alt tags that describe the images in posts and webpages, including logos, rooms etc. It is very important that if you have a ADA available room that you have it clearly marked on your rooms page and any charts you have for rooms. You need to identify the room/s that are available and the amenities in those rooms for disabled guests. If you don’t have to comply then you should also mention that on the page. You can see how we did this on the Inner Banks site, we placed in bold that the ADA room has priority for a disabled guest. In addition your booking engine has to identify your ADA rooms and make them available to ADA guests. At any point your last room to be booked should be the ADA room so it is available should an disabled guest want to book. Some booking engines are able to easily identify an ADA rooms, others you may need to be more ingenious in how you make it obvious to a guest. Many of the online travel sites such as Booking.com or Expedia now have sections in your admin area specific to accessibility. Make sure you update your listing on any of these third party services to show your ADA room. Even Airbnb has questions on their site about accessibility for vacation rentals, so you will need to update all sites with any information you have for disabled guests. https://achecker.ca/checker/index.php – a web based checker to look at pages of your site and give you feedback. Be aware that no webmaster can guarantee your site is 100% compliant but you do need to make changes to bring your website in line as much as possible. The general thought is that if you do take care of maintenance issues, and you add your statement it will make you less vulnerable to a lawsuit but there are no guarantees. If you need assistance understanding or need help to figure out if your website is compliant please contact us at info@lodgingsites.net.